With our extensive design, manufacturing, and installation capabilities, we offer space saving furniture and product applications for almost any area in the home. If you are looking for functional, customized laundry room organizers, utility room cabinets, or space saving pantries, our design consultants can help you conquer any challenge you may have for these difficult areas in your home. It’s a place of “utility.” So make it user-friendly. Too often during a home’s construction, utility areas such as pantries and laundry rooms are added absent the design forethought that went into other rooms. Our goal is to help you maximize your pantry and laundry room organization with functional utility room cabinets and ergonomically designed laundry room organizers. From insanely organized pantry cabinet storage systems to well designed utility room cabinets , the ultimate utility is in the details. It’s time to get the laundry room organization you have always dreamed of with our state-of-the-art laundry room organizers and custom cabinet systems. Pullout Shelving – Maintains easy access and organization to all pantry and utility items. Baskets – Available in chrome, brass, and oil-rubbed bronze. Pull out for quick access. Shelving and Dividers – Entirely adjustable to your storage and utility needs. 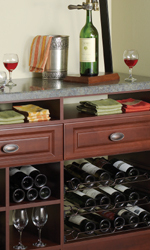 Wine and Spice Racks – Because you can never have too much of either. No more buried items you’ve long forgotten about. No more “why isn’t this shelf over here where I can use it?” No more better-than-nothing. Change puzzling designs into the perfect solutions. Just like we can give you the custom closet of your dreams, we can apply that same ingenuity and beauty to your entire house. You decide what laundry and pantry cabinet storage system would be perfect for you – we make it happen! 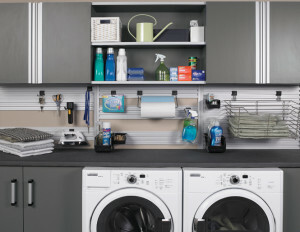 Get started on your pantry and laundry room organization today! Visit a More Space Place Showroom in your area to view our selection of pantry cabinet storage systems and laundry room organizers.